A huge improvement on the classic original Pulse, at a great price. In a word - killer! Sounds huge - way beyond its size (and price!). Matrix interface, dials and large screen are a breeze to use. Plenty of connectivity including MIDI, Audio in. Screen cover came loose. Recessed MIDI connections could cause cable issues. The original Pulse launched in 1996 and at that time (along with the original Novation Bass Station) it stood out for being a new analogue synth in a staunchly digital synth market. 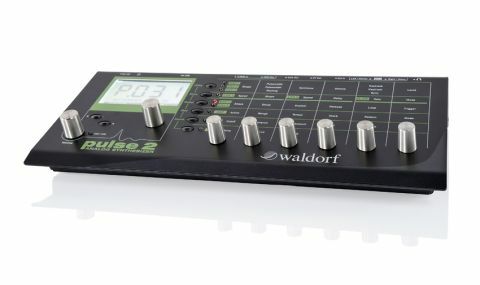 Today, new analogues are plentiful and Waldorf's latest synth, the Pulse 2, (which was first shown at NAMM in 2012) is adding yet another analogue flavour into the mix. Initially, many thought it was merely a concept or 'vapourware' but it's absolutely real! There's no mistaking the lineage of the Pulse 2 - it takes design cues from the classic Pulse and Pulse+ (the Pulse 2 can load original Pulse patches) and also from the 4-pole filter box and the more recent Blofeld. "We really dig the case shape and the green-on-black colour scheme looks fresh too"
We really dig the case shape and the green-on-black colour scheme looks fresh too. On the whole, build quality is spot on. The metal case is solid, as are the eight steel knobs used for the editing, but we did find a couple of minor issues. Firstly, the screen cover came loose on the review unit (we've seen another user report this on a forum - we'll put it down to teething trouble!). Secondly, the MIDI connections are very deeply recessed into the case, so some wider ended MIDI cables only just fit. Unlike the original Pulse, there's no way to rack up the Pulse 2 but then it's designed as a desktop module and this form factor really makes sense for smaller studios and for gigging musicians - it's perfect rucksack fodder! The Pulse 2's interface is very quick to get to grips with. The screen is large, bright and clear and the Matrix style of editing (where you look up a function in the matrix table, select the line/function with a button and change the value with an encoder) works slickly. You soon remember where everything is located and the endless encoders are very precise too, so accurate editing is easy. Our one wish here is that you could press the two selector buttons together to reset any value to 0, rather than having to use the parameter encoder - maybe this could be changed in a software update. Note that an editor is now available here: http://filthyfilterz. com, which enables you to edit the Pulse 2 using your DAW over USB. "It's a real 'sonic chameleon' and can be anything from clean and hi-fi, through to warm and sizzly and beyond to screaming and metallic"
In use, the Pulse 2 is massively addictive and its appeal is wide due to its versatile (and classic) sound engine with deep yet intuitive editing functionality. Sound design gurus will love it (as will analogue addicts and electronic heads). It's a real 'sonic chameleon' and can be anything from clean and hi-fi, through to warm and sizzly and beyond to screaming and metallic. It can cover all types of sound admirably (including poly sounds, see left) and the low-end surprisingly gave my Moog Minitaur (my go to synth for solid synth bass) a run for its money, albeit with a little less extreme sub extension/definition. At its heart are three digitally controlled analogue oscillators, coupled with a noise source and sync. The presets are pretty good (there are 500 user-writeable slots with randomizer) and there are saw, triangle and square waves onboard along with some handy new additional shapes including variable pulse, APW (Alternate Pulse Wave) and X1/X3-PWM (cross modulated PWM). APW enables evolving PWM type textures but without the normal thinning out of the sound, whilst X1/X3-PWM cross-modulates the oscillators for crazy, clangorous sounds. These additional waves help turn the Pulse 2 from a sweet, yet precise and punchy-sounding analogue synth, into a nasty, unhinged and shrill beast, particularly when combined with the onboard ring modulation and VCA drive. "There are some very handy tube and fuzz/drive options and several versatile unison modes for huge, wide sounds"
There are some very handy tube and fuzz/drive options too and several versatile unison modes (with unison detuning) for huge, wide sounds. Surprisingly, these modes can even get you in the ballpark of big analogue monster synths (such as the MemoryMoog+) and the Pulse 2 is therefore great for making not only staple analogue textures but wild modulated FX too, especially when you plumb the depths of the 8-slot modulation matrix, which includes 24 sources and 26 targets. In addition, there are two MIDI-syncable LFOs (with five shapes) that go from super slow to super fast and CV/Gate outs with switchable V/Oct and Hz/V modes, (though unfortunately there are no CV ins like the old Pulse+). Let's also not forget that you can plug other gear into the mono audio input and use the incoming audio as an oscillator, turning the Pulse 2 into a great processor. This is a killer addition that's often sorely missing, even on more expensive synths. Plus the two loopable envelopes (you can use them as pseudo LFOs) are very snappy, so the Pulse 2 excels at cutting Moog-style basses and punchy drum sounds too. In fact, we were able to make some of the punchiest drums sounds we've ever made on an analogue synth, using the envelopes, VCA drive, filter resonance (for the kick) and noise for the snare. The Pulse 2 has really impressed us and at its price point what it offers is unique. Sure, there are no effects onboard but frankly it's an essential piece to own due to its crazily powerful sound engine and great price. Based on sound quality and features alone, it is a worthy upgrade to the original Pulse. It's certainly a new classic in the making and we can't wait for the upcoming keyboard version. Bring it on!